Print Solutions is a monthly trade print magazine distributed across the UK. It is available free, on a sign up basis, to everyone involved in the UK print, design, creative, publishing and marketing industries. It is published by Earth Island. Print Solutions were looking to feature new and inspiring printed paper products to highlight outstanding companies within the industry. As a well-known trade magazine they wanted to stand out and introduce these new products to their readers, many of whom are industry leaders. Amstore Innovation collaborated with Print Solutions to create, design and produce a Digital Key card insert. They ran a cover story and two page spread about the power of Digital Key, explaining how to use the engaging and innovative marketing tool to achieve maximum engagement and interaction. The article’s CTA was simple, insert the device into any USB port for more details about Print Solutions special offers and helpful information. Each Digital Key has an individual code which allowed Print Solutions to monitor the end users activity and because the URL can be updated Print Solutions encouraged their customers to keep hold of the key for future updates and new offers. Print Solutions has since tweeted their followers reminding them to insert the key for new articles, case studies and competitions. 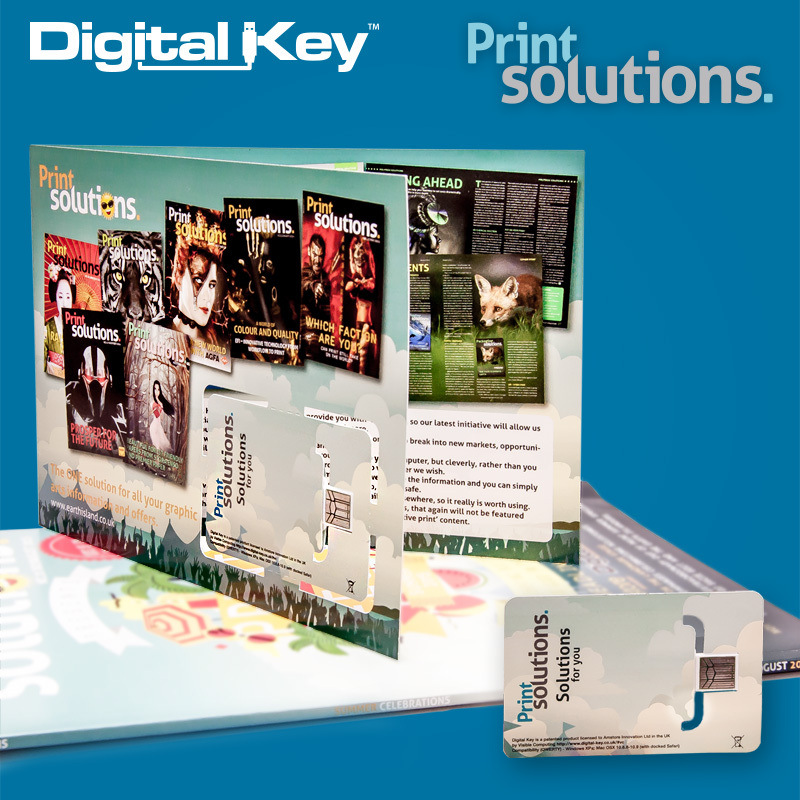 Print Solutions magazine saw a 37% hit rate of usage from their Digital Key campaign.